The DE4 Development Board provides the ideal hardware platform for system designs that demand high-performance, serial connectivity, and advanced memory interfacing. Developed specifically to address the rapidly evolving requirements in many end markets for greater bandwidth, improved jitter performance, and lower power consumption. The DE4 is powered by the Stratix® IV GX device and supported by industry-standard peripherals, connectors and interfaces that offer a rich set of features that is suitable for a wide range of compute-intensive applications. The evaluation of transceiver performance for jitter, protocol compliance, and equalization on the DE4, exceeded the Stratix IV GX performance standard with transceivers operating at 10 Gbps on SATA and HSMC interfaces! The advantages of the Stratix® IV GX FPGA platform with embedded transceivers has allowed the DE4 to fully compliant with version 2.0 of the PCI Express standard in addition to serial ATA (SATA) interfaces making it possible to leverage the integration option for storage applications. 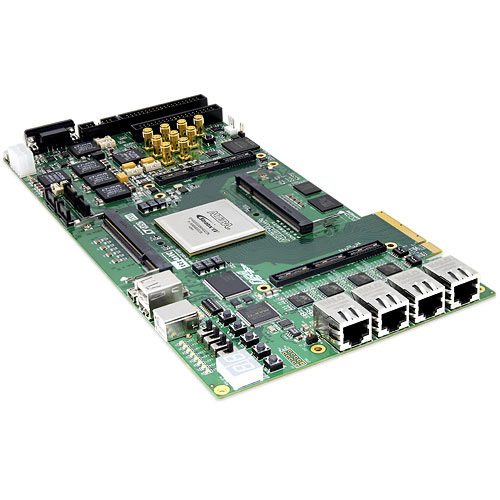 The DE4 delivers fully tested and supported connectivity targeted reference design that integrates built-in blocks for PCI Express, SATA transceivers, and Gigabit Ethernet protocol. Situated on the DE4 also includes two DDR2 SO-DIMM socket supporting maximum capacity of 8-Gbyte of volatile memory for user applications which are capable running at 400 MHz clock rate. The DE4 is supported by multiple targeted reference designs and two High-Speed Mezzanine Card (HSMC) connectors that allow scaling and customization with mezzanine daughter cards. For large-scale ASIC prototype development, it can be established by a cable connecting to multiple DE4/FPGA boards through the HSMC connectors.